I saw the Hobbit and it renewed the feeling I get every so often when playing D&D. Dwarves and bad-asses and you should not mess with them. This notion inspired me to post this. Enjoy! The Xothia appear in my latest book, The Witch, but can be used in any Retro clone that has dwarves. OGL declaration. All text below is designated as Open under OGL. All art is retained by the copyright holder and is not open under the OGL. “Where are we headed Jornek?” asked Tuir, a young hill dwarf of only 80 summers. They were walking in the rain up a mountain path, and Tuir hated the rain. “I thought we were going to go to the human city and seek out one of their sages?” replied Tuir. Tuir was so quiet the rest the trip that Jornek almost regretted not telling him sooner. But soon enough they approached a small cave opening. Outside was small, but ornate gold gong. Jornek took the striker and hit the gong three times. Tuir looked at the gong quizzingly and then to Jornek. The older dwarf guessing his question only replied, “who would *dare* steal it?” Jornek then walked into the cave with a nervous Tuir close behind. The sight that met Tuir’s eyes was almost overwhelming. He had expected the cave to be dark, damp and gloomy, like a goblin’s hole, but instead it seemed, well more “elf” like. There were brightly colored lamps hanging from outcroppings in the walls that sent an array of colors everywhere. The floor was amazingly flat and clean. To the back of this chamber were several doors. But Tuir was not prepared for what, or rather who, he saw next. She was young, maybe no older than himself. She wore brightly colored clothes that were still dwarven style, but some how seemed more elfish. Her most striking feature to Tuir was her face. While she was obviously beautiful, she had no beard. Among his clan a woman without a beard had no prospects of finding a husband. This woman seemed not to care. “Merry Greetings, Jornek, Gornek’s son.” she said with a voice that sounded musical to Tuir’s ears. “Please do us the honor of your presence.” And with that she bowed slightly. “Greetings to you and may I return some of the hospitality that you show today.” Jornek said as he bowed even lower. “You’re the…the Xothia of the Rock?” Tuir stammered out. This got him a angry glare from Jornek, but a small musical laugh from the woman. The followed the woman to another, even larger chamber filled with lights. Tuir was surprised to see a few other women, even a gnome woman. Most were writing in long scrolls, some were to busy starring at the new guests. Then an unbelievably old woman entered the room. The rest of the women snapped to attention, she made a motion with her hand and they all left. Like the first and the current old woman, none of the women had beards. She repeated the greeting to Jornek as the younger woman had, only she added his grandfather, great-grandfather and great-great grandfather as well. Jornek had bowed even lower than he had before, his great beard sweeping the floor. She then addressed Tuir. Jornek, as custom dictated, answered for his young charge. Tuir was too dazed to say anything or even move. It was not till he got a withering glance from the elder dwarf that he too bowed low. Finally the Xothia looked at Tuir, starring at him, or through him, as if to divine his need. She seemed to be unbelievably ancient to the young dwarf, and yet he still saw something in her eyes that spoke of youth. She addressed him in voice that reminded him of the echo of a subterranean pool. “He is a fool Xothia, were he not my sister’s son.” Jornek started but was cut short by the woman. To Tuir’s surprise, and he admitted delight, Jornek seemed quite taken aback at this. “It is the privilege of youth to be foolish, but the responsibility of the aged to be wise. If we wish not our young ones to be fools then we must teach them.” She said without even looking at Jornek. In their clan no one would have silenced Jornek as if he were child. But no one in their clan was the Xothia either. The dwarven witch feels isolation from her normal community due the distrust of arcane magic among dwarves. This distrust seems to date back in time to the first recorded appearance of dwarven witches, a coincidence that seems too strong to ignore. In dwarven society, men and women are regarded as equals. The dwarven witch is seen as contrary to this established reality. Most dwarven witches feel deep fear when they first hear the Call and either leave their communities or try to suppress what they now know and feel. Dwarven witches become Solitaries, learning their art and faith directly from the Mother of Dwarves herself. The social stigma of being a magic-using dwarf is tough to bear; and due their nature, dwarven witches tend to be far more chaotic than the normal dwarf population. While some find content with this life, others are constantly reminded that they will never truly belong, either as a dwarf or as a witch. Dwarven witches are the rarest form of witch one will encounter. 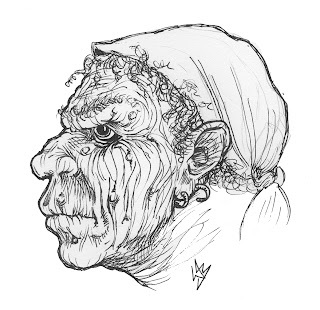 The Xothia (“Zoe-thee-Ah”) witch of dwarven communities has taken her nearly insurmountable odds and turned them into unique advantages. Feared for her power, isolated because of her ideals, and respected for her knowledge, the Xothia has become a living repository of dwarven lore, knowledge and magic. All Xothia are female -- no male has ever joined their ranks -- and all are beardless. Whether the Xothia are born that way or have their beard removed is one of but hundreds of their closely guarded secrets. The leader of a coven of Xothia is often known as the Xothia, and is usually centuries old. She is regarded as an advisor and sage to dwarven leaders; many will travel days or weeks to seek her out. The Xothia lives apart from the main community of dwarves, where she and her coven can use magic to scry and record all that needs to be known. Often such answers cannot be gathered by magic and the Xothia witch must travel the world in search of them. A full coven of Xothia is nine witches, eight members and the Xothia. Their manner and style of clothing have often been described as “elf-like,” not in insult, but as a means for the common dwarf to label what she does not know. The ritual tools of the Xothia are the “Labrys” or small double bladed axe, and the “Malleus” or hammer. The labrys may be wielded with one hand. It has two semi-circular blades on either side. The labrys has a small knob on top of the shaft located between the two blades. The Xothia Tradition is most similar to the Craft of the Wise, Classical or Family Traditions of Witchcraft and they may take the same Occult powers of those traditions. The highest level witch regardless of level or title is known as The Xothia. *Includes the bonuses Dwarven Witches also gain.